In the space of one incredible fortnight during July 2016, three potential British and two Welsh shark records were broken. I say potential because while there is absolutely no doubt about the authenticity off the three fish concerned, no records were claimed, and nor could they be, having been released after taking measurements for weight estimation in the case of the two boat caught fish. 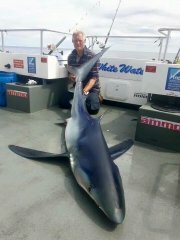 The biggest, a 368 pound Thresher Shark caught by Nick Lane, plus a 242 pound Blue Shark taken by Danny Fitch, were both disqualified through release by angler choice, and well done to both anglers and their respective charter boat skippers Daniel Hawkins and Andrew Alsop for doing that. The third shark, a shore caught Porbeagle which would have been a record at any weight above the ridiculous British Record Fish Committee (BRFC) qualifying weight of 40 pounds which this fish clearly well bettered, was legally prevented from being brought to the scales even had captors Mark Turner and Simon Shaw wanted to, which again they didn't, all of which speaks volumes about some of the antiquated head burying dinosaurial thinking by some, though I stress not all of the people sitting on the BRFC today. EP 217. Andy Griffith, Thresher Sharks. Recorded in 2018. Thresher Sharks are the jewel in the crown so far as shark angling goes. For those wanting to complete the UK shark Gand Slam, they probably rate on a par with the Mako Shark. Least ways they did until recent times when the grounds to the east of the Isle of Wight started producing them reasonably regularly. Still a rarity though, and a species Andy Griffith required to complete his Grand Slam. But instead of being fortunate enough to catch one, here he describes three days fishing which produced the staggering total of five. EP 216. Sam Harris, 'Gone Fishing'. Recorded in 2018. 'Gone Fishing radio show host Sam Harris is used to being the one dishing out the questions. In a reversal of rules here he is put on the receiving end in an examination of his long and varied angling life. EP 215. Andy Griffith, Six Gilled Sharks. Recorded in 2018. Having completed a unique IGFA gand slam for Sharks in British waters including taking the Welsh Mako Shark record, it looked unlikely that Andy Griffith would be able to top that achievbement on home turf. But top it he has with two Sharks in excess of 1000 pounds both taken on the sane day.